Star Wars Rebels review: "A Princess on Lothal"
It's never easy to bring a famous face into a TV show about less famous faces, especially while that show is still finding its footing. Star Wars Rebels avoided showing Yoda on screen in his debut episode, it gave Obi-Wan Kenobi only a brief holographic role, and it has largely kept Darth Vader in the shadows. But at the beginning of the second half of season 2, Rebels is ready to start introducing bigger players in more commanding roles, even if it's only for a single episode. That's what happened with Princess Leia Organa in "A Princess on Lothal." Yes, she stole the show, but she charitably lent some of the show back to its main characters—especially the presently troubled Ezra, on whom she seemed to have a profound, and welcome, impact. Leia's voice was the only thing I didn't like about her. Everything else worked so wonderfully well. Steven Melching's writing gave her wit and charm a chance to shine. Her interactions with her fellow rebels and the Imperials who were ostensibly on her side were both great. She was mature for her age, but not too mature; she didn't get everything right, but one got the sense that missions such as the one to Lothal were routine enough for her that she'd picked up a few tricks. Indeed, Lieutenant Lyste described her ships as "another meddling delegation from Alderaan," a line that offered a world of insight into Leia and Bail's covert activities. The fact that Alderaan was known as a planet of bleeding-heart liberals also adds context to the events of A New Hope. One imagines that Tarkin and Vader were only too happy to rid the galaxy of those meddlesome peaceniks. With nearly every line she spoke, Leia revealed something about herself as a 15-year-old. From the line "There's no turning back now," we learned that Leia seemed to relish these kinds of risky mercy missions, where she would be charging into danger with only her planet of origin as a cover story. When she told Kanan, "I know who you are," she revealed the extent to which she was briefed on Lothal sector activities—and given Lothal's backwater status, this could suggest that she was fully briefed on all the disparate rebel movements, which would suggest that Bail trusted her greatly. Expanded Universe sources hinted at Leia's deep involvement in the early years of the movement. In the space of a few bits of dialog, Rebels confirmed this. If Leia routinely went on these mercy missions, she would naturally have grown familiar with the ambitious, low-level Imperial bureaucrats watching her every move. "A Princess on Lothal" did an excellent job of showing this to us. After so many missions, Leia knew the routine, and she knew what part she had to play. When she said, "First I have to deal with the lieutenant," she conveyed both her irritation with meddling Imperials and her eagerness to begin the familiar diplomatic dance. As one might expect from her royal upbringing, she was easily capable of adopting a condescending attitude to throw Lieutenant Lyste off his game. But this time was different for Leia. The Lothal Imperials brought magnetic locks for her cruisers and two AT-ATs to guard them. Leia was the one caught off-guard, and Rebels did a nice job of showing it. Kanan underestimated her when he told her not to feel bad because someone else's plan had failed; she half-proudly, half-sadly replied that it had been her plan. Even Kanan, who knew enough to recognize her as Bail Organa's agent, had doubted her seniority in her father's ranks. The Leia we met in Rebels was already starting to become A New Hope's savvy planner and big-picture thinker, the tactician who tired of small thinking. "You don't understand," she told Ezra when he asked why they couldn't hand off the ships in space. "It's not that simple." This was a nice reminder that, while Ezra's experiences had taught him much, there was a world of higher-level planning that his team hadn't really engaged in yet. They were one small part of a big puzzle, a puzzle that Bail and Leia had to organize. Rebels gave us both this hard-nosed tactician and a softer, more compassionate side of Leia. This made perfect sense. She wasn't just a senior rebel; she was also a 15-year-old royal diplomat. She had to know how to perceive what people were going through and help put them on the path that she needed them to travel. We saw her do this with Ezra. After overhearing the Ghost crew consoling him over the deaths of his parents, she demonstrated her empathy by inquiring after him and trying to raise his spirits. I suspect that the scene that followed will get short shrift in reviews of "A Princess on Lothal." But Leia's warmth and empathy are just as important to her shifting leadership roles—princess, princess-ambassador, and eventually general—as her stubbornness and political and military savvy. Leia was well positioned to console Ezra. The best exchange of dialog in the episode was when Kanan said, "It's a challenge being his age with so much responsibility," and Leia responded, "I know that feeling." She might be much more powerful than Ezra, both on Alderaan and in the growing Rebellion, but they did share their youth and the weight of some unusual degree of responsibility. And Ezra's responsibility was considerable. He had to learn to navigate the power of the Force itself—and without the comforting presence of his parents. The progression of the scene between Ezra and Leia in the Ghost's gun turret was very interesting. Leia tried to make Ezra feel important by telling him that she'd heard his famous transmission. But he didn't want to think about that message, because that's what had gotten his parents killed. It almost seemed as if he were growing disillusioned with the rebel fight; he certainly expressed his doubts about its chances of success. Losing someone close to you tends to plant those doubts. Leia saw the problem, and she knew she couldn't let Ezra succumb to his grief and doubt. She tried to convey to him the urgency of fighting. Ultimately, it was Leia's peculiar situation—a person with wealth and privilege jeopardizing it to alleviate the suffering of others—that drove her point home for Ezra. She fought, she told him, because others couldn't, and by carrying on despite the loss of his parents, Ezra would be doing the same thing. She urged him to see that what they were doing mattered no matter how many people they lost along the way—not an easy argument for someone with few life choices to hear from someone with money and power. But it worked. Ezra gained the resolve to help finish the mission. And viewers gained a new appreciation for Leia's motivational ability. But the princess wasn't done yet. She then gave the Ghost crew a pep talk by telling them that they had earned the challenge the Empire had placed in front of them. Just as the walkers and magnetic locks and extra stormtroopers were worthy of the rebel threat that the Ghost crew posed, so too was the crew worthy of meeting that challenge. Leia demonstrated her inspirational ability by convincing them that the impossible was possible—that they could free her ships. One by one, team members piped up to contribute their expertise to the mission. Even Ryder, who had sworn that he wouldn't risk going back to an Imperial prison, got involved again. As fun as it was to see Leia do and say all of these things, my favorite part of her presence in the episode was her giving Lieutenant Lyste a hard time. She was clearly enjoying it, too. She was a skilled planner and liar, and Lyste was clearly neither. Her encounters with him suggested that toying with less perceptive Imperials was a fun bonus to saving the galaxy. The whole bit at the end with her grilling him over her lost ships was very fun. Imperials like Lyste, who command overwhelming resources, pride themselves on control, and here, with Leia, young Lyste was not in control. He was positively flustered. "Lieutenant," she asked coyly after demanding that Lyste lend her his shuttle, "did you lose your ship too?" 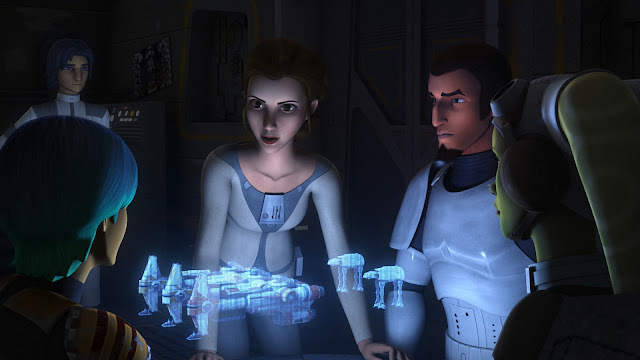 I think it's fair to say that Leia overshadowed the Ghost crew in "A Princess on Lothal." But that was fine by me. It was a treat to see her appear on the show. As a result, however, the rest of the crew didn't really have much to do except follow her lead. The one person who got close to sharing the stage with her was Ezra, whose naivety and impulsiveness contrasted nicely with Leia's worldliness and regal composure. Ezra initially seemed reluctant to accompany Kanan on the cruiser-retrieval mission. This was understandable. He had just learned that his parents had died trying to break out of prison after hearing his transmission. Whether it was partly guilt or purely sorrow, Ezra, who despite his accomplishments was barely a teenager, seemed overcome with sadness. One can imagine how the loss of his parents might cause him to question the viability of the rebels' goals. (One can also imagine that defusing such potentially crippling demoralization had become a regular part of Leia's mercy-mission routine.) Understandably, Ezra seemed different at the start of this mission. Unlike Kanan, who recognized that Leia was in charge as soon as she descended her cruiser's boarding ramp, Ezra didn't understand why he should trust or follow her. After all, they were the same age, and here she was bossing him around from the moment her feet hit the soil of his home world. Ezra being the same age as Leia made this episode very interesting for various reasons. For one thing, there was the contrast between their personalities and demeanors. For another, her ability to motivate him showed how much more mature she was, which played into our evolving understanding of who Leia was—and what she had seen and done—at the time of her capture in A New Hope. But there was also the simple fact that they were both essentially children trying to navigate a hostile and complex galaxy. It was believable, therefore, that Ezra would try to impress Leia by Force-grabbing two stormtroopers' blasters—just as it was believable that, in his enthusiasm, he would overcompensate and smack himself in the head with one of them. Of course, Ezra and Kanan's Force powers were a genuine surprise to Leia, and you could see that Ezra enjoyed being the one in the know while Leia gaped at Kanan's impressive takedown of an AT-AT walker. Ezra grew to like Leia by the end of the episode. He enjoyed "making it look real," as she put it just before the rebels escaped. This, too, made perfect sense: Leia was in the same game as him, even if she carried herself with a level of grace and tenacity that surprised and intimidated him. As a 15-year-old Force-sensitive freedom fighter, Ezra is probably more mature, powerful, and savvy than most of the other young teenagers he's likely to encounter. That's why Leia's appearance was so important to his character development—she wasn't like other 15-year-olds. She was better than him at pretty much everything. She knew more, had done more, and operated a large stage than him. The fact that he eventually developed a respect for her aims and her methods spoke well of him. Before I wrap up, I have to once again commend Steven Melching, who wrote "A Princess on Lothal." In addition to the great storytelling with Leia and Ezra, this episode was seasoned with high-quality, A New Hope-esque humor. Think of exchanges like "Do you ever listen to yourself?" "Yes, and I happen to be very interesting," or "More friends of yours?" "Yeah, I'm a likeable guy." Think of Zeb relishing the chance to beat up Kanan and Ezra and use the excuse that it was part of the mission. Think of the stormtrooper blasting away at the fleeing rebels and telling his partner, "They're taking prisoners? They do that now?" Oh, and one final note: After Kanan took down the AT-AT with his lightsaber, there was absolutely a hint of Rey's Theme in the music. Who knows what that says about Kanan, or Rey, or both of them. Maybe it was just a subtle nod to The Force Awakens. Or maybe it really was something more. Ordinarily I'd dismiss the idea of a connection there, but after seeing the trailer for the second half of Rebels season 2, I'm not willing to rule it out. With superb writing and excellent exposition of both its young hero and a famous face, "A Princess on Lothal" brought Rebels back onto TV screens in a solid way. It expanded our understanding of Leia Organa, one of the saga's most important and most beloved characters. Voice issues aside, Star Wars Rebels acquitted itself well with the tough task of believably establishing a younger Leia. Her appearance also moved Ezra forward on his path, meaning that, instead of displacing the core Rebels storyline, her scene-stealing presence amplified it. The Rebels team should be proud of "A Princess on Lothal," and I hope it serves as the template for future famous-face-cameo episodes.